IH Window Cleaning offers a bespoke service to all our customers, whether you just have a few windows or an entire building of glass we can offer a great service at a competitive price. We will visit you on site to discuss and assess your needs and carry out the work on an agreed schedule. 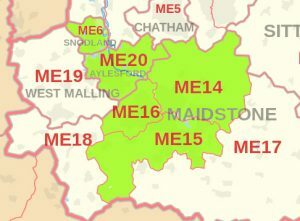 We undertake work in ME6 ME14 ME15 ME16 & ME20. Any inaccessible windows that could not previously be reached on your property — such as third ﬂoor windows, dormer windows, skylights, conservatories and sloping roofs can now be cleaned easily – even the window frames and sills can be cleaned on each and every visit. 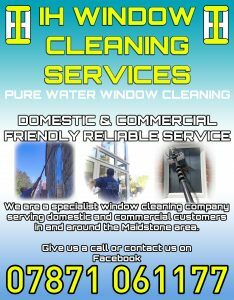 Please note that if your windows have been cleaned previously using detergents or chemicals it may take two or three visits using the Water Fed Pole System to eliminate any detergent or trapped dirt leaching from corners in the surrounding window frames. This may initially result in minor spotting on your windows. However, please be assured that once this is cleared the end result will be agreeable. Your windows will be cleaned using a new technology that has now become industry standard. 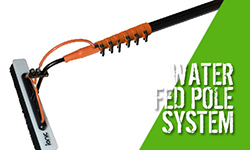 This new technology is called a Water Fed Pole and it cleans your windows using puriﬁed water. We are now using this method for the following reasons. Pure water, unlike soft or hard water, has no dissolved minerals and requires no soap surfactants or conditioners to overcome hardness or other dissolved components. Therefore provides a perfectly clean surface when the water dries naturally by evaporation – this process involves brushing your windows clean with pure water resulting in the glass being left wet but the end result will be sparkling clean and smear free windows. Only pure water is used, eliminating the need for detergents and chemicals. As a company we take pride in our efforts to improve on our safe working in the window cleaning industry and on the level of service that we offer our customers. Should you have any questions or concerns about our service please don’t hesitate to contact us. All work will be considered. Contact us today for a quote or to discuss your needs with one of our team.